A 23-year-old British man feared kidnapped in Vietnam has been found safe and well, relatives have said. 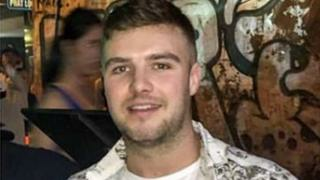 Connor Leslie, from Newtonhill in Aberdeenshire, was last seen at about 02:30 local time (21:30 BST on Friday) in Hanoi. He was in the city with a group of friends who got out of a taxi which apparently sped off before Mr Leslie could step out of the car. The Leslie family said he was fine and would continue his holiday. It is understood he managed to make his own way back to his companions. Friends and family could not contact him on his mobile after he went missing and his cousin said on Saturday afternoon that his messaging app had been offline for about 17 hours. Members of Mr Leslie's family had shared information about his disappearance on Facebook after he was last seen at Tay Ho 395 on Lac Long Quan. Mr Leslie's brother Ross told BBC Scotland his brother was fine other than having blisters on his feet. His cousin Scott Leslie earlier said the whole family had been "absolutely terrified" waiting for news of Mr Leslie. "He was in a taxi and his friends were getting out. Connor was the last to get out and the taxi driver just sped off before Connor could get out of the car," he told BBC Scotland. It is understood that the group may have had an argument with the taxi driver about money. Mr Leslie added: "It's fantastic news that he's been found." Connor Leslie, who works in the oil and gas industry, was with a group of friends who were just starting their holiday in Vietnam. His family said he would now continue with the holiday. The group is expected to travel to Australia next.